This past January, I finally joined the Kendra Scott Family. No, not working for them (although if I did, they could just keep my paycheck)- but finally having my own pair of the earrings! As you know I am very much so into jewelry, how it's made, the stones. And like my rings, I like being able to personalize it to my own liking. So rewind to January-which was still Winter Break for me, I met up with my dear friend Jamie for brunch in City Centre at Sweet Paris. She was wearing a pair of beautiful Kendra Scott earrings, and she then told me that during your birthday month you get 50% off your purchase! *gasp, what?! How did I not have this information?! 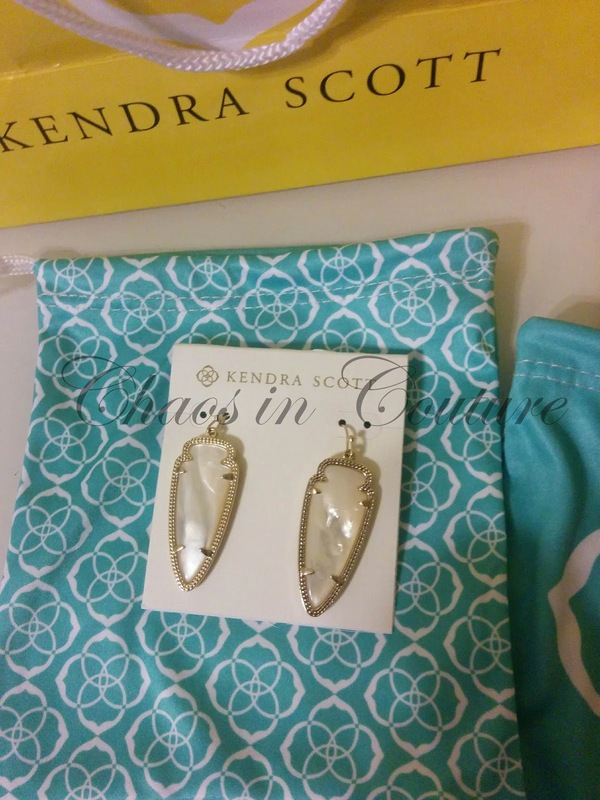 * Conveniently, there is a Kendra Scott in City Centre. 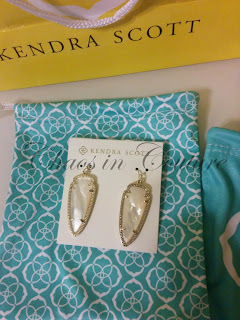 So, after brunching on delicious savory crepes, off we went to Kendra Scott. I was in awe. It was gorgeous, the different hues, the gems, and rocks, stones, etc. I felt overwheledm, should I get something simple? Everyday wear? Silver? Gold? Cougar Red? Black? The choices are endless. Literally. But then I realized I never really had a nice pair of 'everyday' gold earrings. I spotted what was a bit of a more new design, the Skylar earrings, a mix of their rounded and most-known arrow shape. I spotted the ivory mother pearl. I know I wanted something that would go with everything. So it was done. I purchased the Skylar Earrings in 14K Gold plated over Brass with Pearl . Aren't they gorgeous?! Think this is the end of story? Well, no it's not. That following weekend, my birthday weekend, my dad agreed to get me something that I personally wanted. Now if you remember my dad has a keen eye for real stones, and materials when it comes to jewelry. We went to the store, and I knew I wanted a pair of silver earrings, that would go on basically everything. But I didn't want the same stone I already had. So, over my dad went to the Color Bar. He told me about their rose quartz, it was gorgeous- but too pink for my liking. This is where I realized I could pick my own! 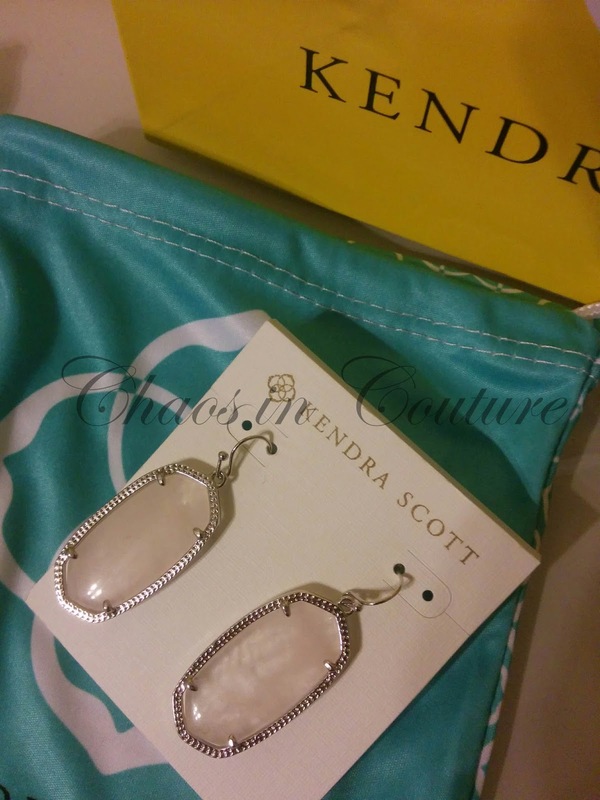 (Rose Quartz is one of the few natural stones that Kendra Scott carries). I picked my two stones making sure they matched, shape wise, color, striations, etc. I wanted them to be perfect! And they are. The more pink I wear, the more pink they look, but because of the clarity of it, it almost looks clear, but not to the point that they're not noticeable. I took home with me the Danielle Drop Earrings in a Rhodium Silhouette with Rose Quartz. Danielle Drop in Rhodium with custom picked Rose Quartz. I love the idea of the Color Bar. I know they have it online too, but I don't know how I feel of custom picking online-- maybe because each stone has different hues, and when ordering online- you never know!